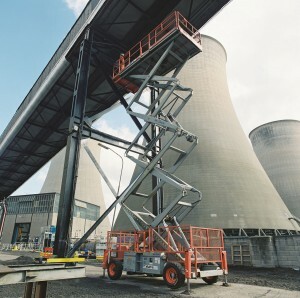 Some of the largest powered access machines from the AFI fleet were hired by contractors carrying out major remedial work to a coal conveyor at Cottam Power Station in Nottinghamshire. HL Engineering hired nine scissor and boom lifts, including two of the largest booms from AFI’s Super-Set range a Genie 135 and a JLG 125 together with a Palfinger P570, the largest truck mounted platform from Wilson Access, a division of AFI. “AFI carried out a site survey and specified the most suitable powered access machines for our work. The scissor lifts were ideal for working underneath the conveyor and we used boom lifts when there was a requirement to reach over it. The 41m horizontal outreach of the Palfinger P570 truck mount enabled us to easily access part of the conveyor that passed over a large dyke,” he added. The AFI powered access machines used on the Cottam Power Station project included Skyjack, Haulotte, Genie and JLG scissor and boom lifts with working heights from 50ft to 135ft.